1.1 What is a Cell? A cell is a structure as well as a functional unit of life. Every living thing has cells: bacteria, protozoans, fungi, plants, and animals are the main group of living things. Some organisms are made up of just one cell are called unicellular. (e.g. bacteria and protozoans), but animals, including human beings, are multi-cellular. An adult human body is composed of about 100,000,000,000,000 cells! Each cell has basic requirements to sustain it, and the body's organ systems are largely built around providing the many trillions of cells with those basic needs (such as oxygen, food, and waste removal). There are about 200 different kinds of specialized cells in the human body. When many identical cells are organized together it is called a tissue (such as muscle tissue, nervous tissue, etc). Various tissues organized together for a common purpose are called organs (e.g. the stomach is an organ, and so is the skin, the brain, and the uterus). Ideas about cell structure have changed considerably over the years. Early biologists saw cells as simple membranous sacs containing fluid and a few floating particles. Today's biologists know that cells are inconceivably more complex than this. Therefore, a strong knowledge of the various cellular organelles and their functions is important to any physiologist. If a person's cells are healthy, then that person is healthy. All physiological processes, disease, growth and development can be described at the cellular level. Although there are specialized cells - both in structure and function - within the body, all cells have similarities in their structural organization and metabolic needs (such as maintaining energy levels via conversion of carbohydrate to ATP and using genes to create and maintain proteins). Here are some of the different types of specialized cells within the human body. Nerve Cells: Also called neurons, these cells are in the nervous system and function to process and transmit information (it is hypothesized). They are the core components of the brain, spinal cord, and peripheral nerves. They use chemical synapses that can evoke electrical signals, called action potentials, to relay signals throughout the body. Epithelial cells: Functions of epithelial cells include secretion, absorption, protection, transcellular transport, sensation detection, and selective permeability. Epithelium lines both the outside (skin) and the inside cavities and lumen of bodies. Exocrine cells: These cells secrete products through ducts, such as mucus, sweat, or digestive enzymes. The products of these cells go directly to the target organ through the ducts. For example, the bile from the gallbladder is carried directly into the duodenum via the bile duct. Endocrine cells: These cells are similar to exocrine cells, but secrete their products directly into the bloodstream instead of through a duct. Endocrine cells are found throughout the body but are concentrated in hormone-secreting glands such as the pituitary. The products of the endocrine cells go throughout the body in the bloodstream but act on specific organs by receptors on the cells of the target organs. For example, the hormone estrogen acts specifically on the uterus and breasts of females because there are estrogen receptors in the cells of these target organs. red blood cells (erythrocytes). The main function of red blood cells is to collect oxygen in the lungs and deliver it through the blood to the body tissues. Gas exchange is carried out by simple diffusion. various types of white blood cells (leukocytes). They are produced in the bone marrow and help the body to fight infectious disease and foreign objects in the immune system. White cells are found in the circulatory system, lymphatic system, spleen, and other body tissues. Cells are the smallest structural & functional living units within our body, but play a big role in making our body function properly. Many cells never have a large increase in size like eggs, after they are first formed from a parental cell. Typical stem cells reproduce, double in size, then reproduce again. Most Cytosolic contents such as the endomembrane system and the cytoplasm easily scale to larger sizes in larger cells. If a cell becomes too large, the normal cellular amount of DNA may not be adequate to keep the cell supplied with RNA. Large cells often replicate their chromosomes to an abnormally high amount or become multinucleated. Large cells that are primarily for nutrient storage can have a smooth surface membrane, but metabolically active large cells often have some sort of folding of the cell surface membrane in order to increase the surface area available for transport functions. Several different molecules interact to form organelles within our body. Each type of organelle has a specific function. Organelles perform the vital functions that keep our cells alive. The boundary of the cell, sometimes called the plasma membrane, separates internal metabolic events from the external environment and controls the movement of materials into and out of the cell. This membrane is very selective about what it allows to pass through; this characteristic is referred to as "selective permeability." For example, it allows oxygen and nutrients to enter the cell while keeping toxins and waste products out. The plasma membrane is a double phospholipid membrane, or a lipid bilayer, with the nonpolar hydrophobic tails pointing toward the inside of the membrane and the polar hydrophilic heads forming the inner and outer surfaces of the membrane. The molecular structure of the cell membrane. Proteins and cholesterol molecules are scattered throughout the flexible phospholipid membrane. Peripheral proteins attach loosely to the inner or outer surface of the plasma membrane. Integral proteins lie across the membrane, extending from inside to outside. A variety of proteins are scattered throughout the flexible matrix of phospholipid molecules, somewhat like icebergs floating in the ocean, and this is termed the fluid mosaic model of the cell membrane. Channel proteins: Proteins that provide passageways through the membranes for certain hydrophilic or water-soluble substances such as polar and charged molecules. No energy is used during transport, hence this type of movement is called facilitated diffusion. Transport proteins: Proteins that spend energy (ATP) to transfer materials across the membrane. When energy is used to provide passageway for materials, the process is called active transport. Recognition proteins: Proteins that distinguish the identity of neighboring cells. These proteins have oligosaccharide or short polysaccharide chains extending out from their cell surface. Adhesion proteins: Proteins that attach cells to neighboring cells or provide anchors for the internal filaments and tubules that give stability to the cell. Receptor proteins: Proteins that initiate specific cell responses once hormones or other trigger molecules bind to them. Electron transfer proteins: Proteins that are involved in moving electrons from one molecule to another during chemical reactions. Passive transport describes the movement of substances down a concentration gradient and does not require energy use. Bulk flow is the collective movement of substances in the same direction in response to a force, such as pressure. Blood moving through a vessel is an example of bulk flow. Simple diffusion, or diffusion, is the net movement of substances from an area of higher concentration to an area of lower concentration. This movement occurs as a result of the random and constant motion characteristic of all molecules, (atoms or ions) and is independent from the motion of other molecules. Since, at any one time, some molecules may be moving against the gradient and some molecules may be moving down the gradient, although the motion is random, the word "net" is used to indicate the overall, eventual end result of the movement. Facilitated diffusion is the diffusion of solutes through channel proteins in the plasma membrane. Water can pass freely through the plasma membrane without the aid of specialized proteins (though facilitated by aquaporins). Osmosis is the diffusion of water molecules across a selectively permeable membrane. When water moves into a body by osmosis, hydrostatic pressure or osmotic pressure may build up inside the body. Dialysis is the diffusion of solutes across a selectively permeable membrane. Transport proteins in the plasma membrane transfer solutes such as small ions (Na+, K+, Cl-, H+), amino acids, and monosaccharides. The proteins involved with active transport are also known as ion pumps. The protein binds to a molecule of the substance to be transported on one side of the membrane, then it uses the released energy (ATP) to change its shape, and releases it on the other side. The protein pumps are specific, there is a different pump for each molecule to be transported. Protein pumps are catalysts in the splitting of ATP → ADP + phosphate, so they are called ATPase enzymes. The sodium-potassium pump (also called the Na+/K+-ATPase enzyme) actively moves sodium out of the cell and potassium into the cell. These pumps are found in the membrane of virtually every cell, and are essential in transmission of nerve impulses and in muscular contractions. Cystic fibrosis is a genetic disorder that results in a mutated chloride ion channel. By not regulating chloride secretion properly, water flow across the airway surface is reduced and the mucus becomes dehydrated and thick. Exocytosis, which describes the process of vesicles fusing with the plasma membrane and releasing their contents to the outside of the cell. This process is common when a cell produces substances for export. Endocytosis, which describes the capture of a substance outside the cell when the plasma membrane merges to engulf it. The substance subsequently enters the cytoplasm enclosed in a vesicle. Phagocytosis or cellular eating, occurs when the dissolved materials enter the cell. The plasma membrane engulfs the solid material, forming a phagocytic vesicle. Pinocytosis or cellular drinking occurs when the plasma membrane folds inward to form a channel allowing dissolved substances to enter the cell. When the channel is closed, the liquid is encircled within a pinocytic vesicle. Receptor-mediated endocytosis occurs when specific molecules in the fluid surrounding the cell bind to specialized receptors in the plasma membrane. As in pinocytosis, the plasma membrane folds inward and the formation of a vesicle follows. Note: Certain hormones are able to target specific cells by receptor-mediated endocytosis. The gel-like material within the cell membrane is referred to as the cytoplasm. It is a fluid matrix, the cytosol, which consists of 80% to 90% water, salts, organic molecules and many enzymes that catalyze reactions, along with dissolved substances such as proteins and nutrients. The cytoplasm plays an important role in a cell, serving as a "molecular soup" in which organelles are suspended and held together by a fatty membrane. Within the plasma membrane of a cell, the cytoplasm surrounds the nuclear envelope and the cytoplasmic organelles. It plays a mechanical role by moving around inside the membrane and pushing against the cell membrane helping to maintain the shape and consistency of the cell and again, to provide suspension to the organelles. It is also a storage space for chemical substances indispensable to life, which are involved in vital metabolic reactions, such as anaerobic glycolysis and protein synthesis. The cell membrane keeps the cytoplasm from leaking out. It contains many different organelles which are considered the insoluble constituents of the cytoplasm, such as the mitochondria, lysosomes, peroxysomes, ribosomes, several vacuoles and cytoskeletons, as well as complex cell membrane structures such as the endoplasmic reticulum and the Golgi apparatus that each have specific functions within the cell. Threadlike proteins that make up the cytoskeleton continually reconstruct to adapt to the cell's constantly changing needs. It helps cells maintain their shape and allows cells and their contents to move. The cytoskeleton allows certain cells such as neutrophils and macrophages to make amoeboid movements. 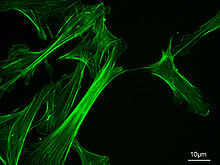 The network is composed of three elements: microtubules, actin filaments, and intermediate fibers. Microtubules function as the framework along which organelles and vesicles move within a cell. They are the thickest of the cytoskeleton structures. They are long hollow cylinders, composed of protein subunits, called tubulin. Microtubules form mitotic spindles, the machinery that partitions chromosomes between two cells in the process of cell division. Without mitotic spindles cells could not reproduce. Microtubules, intermediate filaments, and microfilaments are three protein fibers of decreasing diameter, respectively. All are involved in establishing the shape or movements of the cytoskeleton, the internal structure of the cell. Microfilaments provide mechanical support for the cell, determine the cell shape, and in some cases enable cell movements. They have an arrow-like appearance, with a fast growing plus or barbed end and a slow growing minus or pointed end. They are made of the protein actin and are involved in cell motility. They are found in almost every cell, but are predominant in muscle cells and in the cells that move by changing shape, such as phagocytes (white blood cells that scour the body for bacteria and other foreign invaders). Organelles are bodies embedded in the cytoplasm that serve to physically separate the various metabolic activities that occur within cells. The organelles are each like separate little factories, each organelle is responsible for producing a certain product that is used elsewhere in the cell or body. Cells of all living things are divided into two broad categories: prokaryotes and eukaryotes. Bacteria (and archea) are prokaryotes, which means they lack a nucleus or other membrane-bound organelles. Eukaryotes include all protozoans, fungi, plants, and animals (including humans), and these cells are characterized by a nucleus (which houses the chromosomes) as well as a variety of other organelles. Human cells vary considerably (consider the differences between a bone cell, a blood cell, and a nerve cell), but most cells have the features described below. A comparison of Eukaryote and Prokaryote cells. Controls the cell; houses the genetic material (DNA). The nucleus is the largest of the cells organelles. Cells can have more than one nucleus or lack a nucleus all together. Skeletal muscle cells contain more than one nucleus whereas red blood cells do not contain a nucleus at all. The nucleus is bounded by the nuclear envelope, a phospholipid bilayer similar to the plasma membrane. 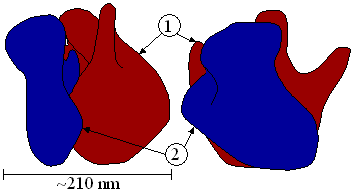 The space between these two layers is the nucleolemma Cisterna. The nucleus contains the DNA, as mentioned above, the hereditary information in the cell. Normally the DNA is spread out within the nucleus as a threadlike matrix called chromatin. When the cell begins to divide, the chromatin condenses into rod-shaped bodies called chromosomes, each of which, before dividing, is made up of two long DNA molecules and various histone molecules. The histones serve to organize the lengthy DNA, coiling it into bundles called nucleosomes. Also visible within the nucleus are one or more nucleoli, each consisting of DNA in the process of manufacturing the components of ribosomes. Ribosomes are shipped to the cytoplasm where they assemble amino acids into proteins. The nucleus also serves as the site for the separation of the chromosomes during cell division. A cross-sectional diagram of a nucleus. A rough sketch of a chromosome. Inside each cell nucleus are chromosomes. 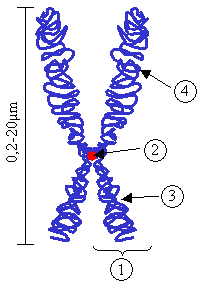 Chromosomes are made up of chromatin, which is made up of protein and deoxyribonucleic acid strands. Deoxyribonucleic acid is DNA, the genetic material that is in the shape of a twisted ladder, also called the double helix. Humans have 23 pairs of chromosomes. Down Syndrome and Cri du Chat Syndrome result from having an abnormal number of chromosomes. Centrioles are rod like structures composed of 9 bundles which contain three microtubules each. Two perpendicularly placed centrioles surrounded by proteins make up the centrosome. Centrioles are very important in cellular division, where they arrange the mitotic spindles that pull the chromosome apart. Centrioles and basal bodies act as microtubule organizing centers. A pair of centrioles (enclosed in a centrosome) located outside the nuclear envelope gives rise to the microtubules that make up the spindle apparatus used during cell division. Basal bodies are at the base of each flagellum and cilium and appear to organize their development. Ribosomes play an active role in the complex process of protein synthesis, where they serve as the structures that facilitate the joining of amino acids. Each ribosome is composed of a large and small subunit which are made up of ribosomal proteins and ribosomal RNAs. They can either be found in groups called polyribosomes within the cytoplasm or found alone. Occasionally they are attached to the endoplasmic reticulum. A cutaway view inside a mitochondria. Mitochondria are the organelles that function as the cell "powerhouse", generating ATP, the universal form of energy used by all cells. It converts food nutrients such as glucose, to a fuel (ATP) that the cells of the body can use. Mitochondria are tiny sac-like structures found near the nucleus. Little shelves called cristae are formed from folds in the inner membrane. Cells that are metabolically active such as muscle, liver and kidney cells have high energy requirements and therefore have more mitochondria. Mitochondria are unique in that they have their own mitochondrial DNA (separate from the DNA that is in the nucleus). It is believed that eukaryotes evolved from one cell living inside another cell, and mitochondria share many traits with free-living bacteria (similar chromosome, similar ribosomes, etc). Endoplasmic means "within the plasm" and reticulum means "network". A complex three dimensional internal membrane system of flattened sheets, sacs and tubes, that play an important role in making proteins and shuttling cellular products; also involved in metabolisms of fats, and the production of various materials. In cross-section, they appear as a series of maze-like channels, often closely associated with the nucleus. When ribosomes are present, the rough ER connects polysaccharide groups to the polypeptides as they are assembled by the ribosomes. Smooth ER, without ribosomes, is responsible for various activities, including the synthesis of lipids and hormones, especially in cells that produce these substances for export from the cell. Rough endoplasmic reticulum has characteristic bumpy appearance due to the multitude of ribosomes coating it. It is the site where proteins not destined for the cytoplasm are synthesized. Smooth endoplasmic reticulum provides a variety of functions, including lipid synthesis and degradation, and calcium ion storage. In liver cells, the smooth ER is involved in the breakdown of toxins, drugs, and toxic byproducts from cellular reactions. "Packages" cellular products in sacs called vesicles so that the products can cross the cell membrane and exit the cell. The Golgi apparatus is the central delivery system for the cell. It is a group of flattened sacs arranged much like a stack of bowls. They function to modify and package proteins and lipids into vesicles, small spherically shaped sacs that bud from the ends of a Golgi apparatus. Vesicles often migrate to and merge with the plasma membrane, releasing their contents outside the cell. The Golgi apparatus also transports lipids and creates lysosomes and organelles involved in digestion. Spaces in the cytoplasm that sometimes serve to carry materials to the cell membrane for discharge to the outside of the cell. Vacuoles are formed during endocytosis when portions of the cell membrane are pinched off. Lysosomes are sac-like compartments that contain a number of powerful degradative enzymes. They are built in the Golgi apparatus. They break down harmful cell products and waste materials, cellular debris, and foreign invaders such as bacteria, and then force them out of the cell. Tay-Sachs disease and Pompe's disease are just two of the malfunctions of lysosomes or their digestive proteins. Organelles in which oxygen is used to oxidize substances, breaking down lipids and detoxifying certain chemicals. Peroxisomes self replicate by enlarging and then dividing. They are common in liver and kidney cells that break down potentially harmful substances. Peroxisomes can convert hydrogen peroxide, a toxin made of H2O2 to H2O. Human cells, like other animal cells, do not have a rigid cell wall. Human cells do have an important and variable structure outside of their cell membrane called the extracellular matrix. Sometimes this matrix can be extensive and solid (examples = calcified bone matrix, cartilage matrix), while other times it consists of a layer of extracellular proteins and carbohydrates. This matrix is responsible for cells binding to each other and is incredibly important in how cells physically and physiologically interact with each other. Many prokaryotes have flagella, allowing, for example, an E. coli bacteria to propel its way up the urethra to cause a UTI (Urinary Tract Infection). Human cells, however (and in fact most eukaryotic cells) lack flagella. This makes sense since humans are multicellular, and individual cells do not need to swim around. The obvious exception to this is with sperm, and indeed each sperm is propelled by a single flagellum. The flagellum of sperm is composed of microtubules. Cilia are especially notable on the single-celled protozoans, where they beat in synchrony to move the cells nimbly through the water. They are composed of extensions of the cell membrane that contain microtubules. When present in humans they are typically found in large numbers on a single surface of the cells, where rather than moving cells, they move materials. The mucociliary escalator of the respiratory system consists of mucus-secreting cells lining the trachea and bronchi, and ciliated epithelial cells that move the mucus ever-upward. In this manner mold spores, bacteria, and debris are caught in the mucus, removed from the trachea, and pushed into the esophagus (to be swallowed into a pit of acid). In the oviducts cilia move the ovum from the ovary to the uterus, a journey which takes a few days. A magnified view of several cells, with visible cilia. Desmosomes are protein attachments between adjacent cells. Inside the plasma membrane, a desmosome bears a disk shaped structure from which protein fibers extend into the cytoplasm. Desmosomes act like spot welds to hold together tissues that undergo considerable stress, such as our skin or heart muscle. Tight junctions are tightly stitched seams between cells. The junction completely encircles each cell, preventing the movement of material between the cell. Tight junctions are characteristic of cells lining the digestive tract, where materials are required to pass through cells,rather than intercellular spaces, to penetrate the bloodstream. Gap junctions are narrow tunnels that directly connect the cytoplasm of two neighbouring cells, consisting of proteins called connexons. These proteins allow only the passage of ions and small molecules. In this manner, gap junctions allow communication between cells through the exchange of materials or the transmission of electrical impulses. Cell metabolism is the total energy released and consumed by a cell. Metabolism describes all of the chemical reactions that are happening in the body. Some reactions, called anabolic reactions, create needed products. Other reactions, called catabolic reactions, break down products. Your body is performing both anabolic and catabolic reactions at the same time and around the clock, twenty four hours a day, to keep your body alive and functioning. Even while you sleep, your cells are busy metabolizing. Catabolism: The energy releasing process in which a chemical or food is used (broken down) by degradation or decomposition, into smaller pieces. Anabolism: Anabolism is just the opposite of catabolism. In this portion of metabolism, the cell consumes energy to produce larger molecules via smaller ones. Chemical diagram of an ATP molecule. ATP is the currency of the cell. When the cell needs to use energy such as when it needs to move substances across the cell membrane via the active transport system, it "pays" with molecules of ATP. The total quantity of ATP in the human body at any one time is about 0.1 Mole. The energy used by human cells requires the hydrolysis of 200 to 300 moles of ATP daily. This means that each ATP molecule is recycled 2000 to 3000 times during a single day. ATP cannot be stored, hence its consumption must closely follow its synthesis. On a per-hour basis, 1 kilogram of ATP is created, processed and then recycled in the body. Looking at it another way, a single cell uses about 10 million ATP molecules per second to meet its metabolic needs, and recycles all of its ATP molecules about every 20-30 seconds. Nicotinamide adenine dinucleotide (NAD+) and nicotinamide adenine dinucleotide phosphate (NADP) are two important cofactors found in cells. NADH is the reduced form of NAD+, and NAD+ is the oxidized form of NADH. It forms NADP with the addition of a phosphate group to the 2' position of the adenosyl nucleotide through an ester linkage. NAD is used extensively in glycolysis and the citric acid cycle of cellular respiration. The reducing potential stored in NADH can be converted to ATP through the electron transport chain or used for anabolic metabolism. ATP "energy" is necessary for an organism to live. Green plants obtain ATP through photosynthesis, while other organisms obtain it by cellular respiration. NADP is used in anabolic reactions, such as fat acid and nucleic acid synthesis, that require NADPH as a reducing agent. In chloroplasts, NADP is an oxidising agent important in the preliminary reactions of photosynthesis. The NADPH produced by photosynthesis is then used as reducing power for the biosynthetic reactions in the Calvin cycle of photosynthesis. Chemical diagram of an NADH molecule. MH2 + NAD+ → NADH + H+ + M: + energy, where M is a metabolite. Two hydrogen ions (a hydride ion and an H+ ion) are transferred from the metabolite. One electron is transferred to the positively-charged nitrogen, and one hydrogen attaches to the carbon atom opposite to the nitrogen. The human body synthesizes NAD from the vitamin niacin in the form of nicotinic acid or nicotinamide. Cellular respiration is the energy releasing process by which sugar molecules are broken down by a series of reactions and the chemical energy gets converted to energy stored in ATP molecules. The reactions that convert the fuel (glucose) to usable cellular energy (ATP) are glycolysis, the Krebs cycle (sometimes called the citric acid cycle), and the electron transport chain. Altogether these reactions are referred to as "cellular respiration" or "aerobic respiration." Oxygen is needed as the final electron acceptor, and carrying out cellular respiration is the very reason we breathe and the reason we eat. The glycolytic pathway (glycolysis) is where glucose, the smallest molecule that a carbohydrate can be broken into during digestion, gets oxidized and broken into two 3-carbon molecules (pyruvates), which are then fed into the Kreb's Cycle. Glycolysis is the beginning of cellular respiration and takes place in the cytoplasm. Two molecules of ATP are required for glycolysis, but four are produced so there is a net gain of two ATP per glucose molecule. Two NADH molecules transfer electrons (in the form of hydrogen ions) to the electron transport chain in the mitochondria, where they will be used to generate additional ATP. During physical exertion when the mitochondria are already producing the maximum ATP possible with the amount of oxygen available, glycolysis can continue to produce an additional 2 ATP per glucose molecule without sending the electrons to the mitochondria. However, during this anaerobic respiration lactic acid is produced, which may accumulate and lead to temporary muscle cramping. The Krebs cycle was named after Sir Hans Krebs (1900-1981), who proposed the key elements of this pathway in 1937 and was awarded the Nobel Prize in Medicine for its discovery in 1953. Two molecules of pyruvate enter the Krebs cycle, which is called the aerobic pathway because it requires the presence of oxygen in order to occur. This cycle is a major biological pathway that occurs in humans and every plant and animal. After glycolysis takes place in the cell's cytoplasm, the pyruvic acid molecules travel into the interior of the mitochondrion. Once the pyruvic acid is inside, carbon dioxide is enzymatically removed from each three-carbon pyruvic acid molecule to form acetic acid. The enzyme then combines the acetic acid with an enzyme, coenzyme A, to produce acetyl coenzyme A, also known as acetyl CoA. Once acetyl CoA is formed, the Krebs cycle begins. The cycle is split into eight steps, each of which will be explained below. Step 1: The acetic acid subunit of acetyl CoA is combined with oxaloacetate to form a molecule of citrate. The acetyl coenzyme A acts only as a transporter of acetic acid from one enzyme to another. After Step 1, the coenzyme is released by hydrolysis so that it may combine with another acetic acid molecule to begin the Krebs cycle again. Step 2: The citric acid molecule undergoes an isomerization. A hydroxyl group and a hydrogen molecule are removed from the citrate structure in the form of water. The two carbons form a double bond until the water molecule is added back. Only now, the hydroxyl group and hydrogen molecule are reversed with respect to the original structure of the citrate molecule. Thus, isocitrate is formed. Step 3: In this step, the isocitrate molecule is oxidized by a NAD molecule. The NAD molecule is reduced by the hydrogen atom and the hydroxyl group. The NAD binds with a hydrogen atom and carries off the other hydrogen atom leaving a carbonyl group. This structure is very unstable, so a molecule of CO2 is released creating alpha-ketoglutarate. Step 4: In this step, our friend, coenzyme A, returns to oxidize the alpha-ketoglutarate molecule. A molecule of NAD is reduced again to form NADH and leaves with another hydrogen. This instability causes a carbonyl group to be released as carbon dioxide and a thioester bond is formed in its place between the former alpha-ketoglutarate and coenzyme A to create a molecule of succinyl-coenzyme A complex. Step 5: A water molecule sheds its hydrogen atoms to coenzyme A. Then, a free-floating phosphate group displaces coenzyme A and forms a bond with the succinyl complex. The phosphate is then transferred to a molecule of GDP to produce an energy molecule of GTP. It leaves behind a molecule of succinate. Step 6: In this step, succinate is oxidized by a molecule of FAD (Flavin adenine dinucleotide). The FAD removes two hydrogen atoms from the succinate and forces a double bond to form between the two carbon atoms, thus creating fumarate. Step 7: An enzyme adds water to the fumarate molecule to form malate. The malate is created by adding one hydrogen atom to a carbon atom and then adding a hydroxyl group to a carbon next to a terminal carbonyl group. Step 8: In this final step, the malate molecule is oxidized by a NAD molecule. The carbon that carried the hydroxyl group is now converted into a carbonyl group. The end product is oxaloacetate which can then combine with acetyl-coenzyme A and begin the Krebs cycle all over again. Summary: In summary, three major events occur during the Krebs cycle. One GTP (guanosine triphosphate) is produced which eventually donates a phosphate group to ADP to form one ATP; three molecules of NAD are reduced; and one molecule of FAD is reduced. Although one molecule of GTP leads to the production of one ATP, the production of the reduced NAD and FAD are far more significant in the cell's energy-generating process. This is because NADH and FADH2 donate their electrons to an electron transport system that generates large amounts of energy by forming many molecules of ATP. To see a visual summary of "Kreb Cycle" please click here. The most complicated system of all. In the respiration chain, oxidation and reduction reactions occur repeatedly as a way of transporting energy. The respiratory chain is also called the electron transport chain. At the end of the chain, oxygen accepts the electron and water is produced. This is a simultaneous oxidation-reduction process whereby cellular metabolism occurs, such as the oxidation of sugar in the human body, through a series of very complex electron transfer processes. The chemical way to look at redox processes is that the substance being oxidized transfers electrons to the substance being reduced. Thus, in the reaction, the substance being oxidized (aka. the reducing agent) loses electrons, while the substance being reduced (aka. the oxidizing agent) gains electrons. Remember: LEO (Losing Electrons is Oxidation) the lion says GER (Gaining Electrons is Reduction); or alternatively: OIL (Oxidation is Loss) RIG (Reduction is Gain). The term redox state is often used to describe the balance of NAD+/NADH and NADP+/NADPH in a biological system such as a cell or organ. The redox state is reflected in the balance of several sets of metabolites (e.g., lactate and pyruvate, β-hydroxybutyrate and acetoacetate) whose interconversion is dependent on these ratios. An abnormal redox state can develop in a variety of deleterious situations, such as hypoxia, shock, and sepsis. What major classes of molecules are found within cells? The term is more-specifically used to refer to fatty-acids and their derivatives (including tri-, di-, and mono-glycerides and phospholipids) as well as other fat-soluble sterol-containing metabolites such as cholesterol. Lipids serve many functions in living organisms including energy storage, serve as structural components of cell membranes, and constitute important signaling molecules. Although the term lipid is sometimes used as a synonym for fat, the latter is in fact a subgroup of lipids called triglycerides and should not be confused with the term fatty acid. Carbohydrate molecules consist of carbon, hydrogen, and oxygen. They have a general formula Cn(H2O)n. There are several sub-families based on molecular size. Carbohydrates are chemical compounds that contain oxygen, hydrogen, and carbon atoms, and no other elements. They consist of monosaccharide sugars of varying chain lengths. Certain carbohydrates are an important storage and transport form of energy in most organisms, including plants and animals. Carbohydrates are classified by their number of sugar units: monosaccharides (such as glucose and fructose), disaccharides (such as sucrose and lactose), oligosaccharides, and polysaccharides (such as starch, glycogen, and cellulose). The simplest carbohydrates are monosaccharides, which are small straight-chain aldehydes and ketones with many hydroxyl groups added, usually one on each carbon except the functional group. Other carbohydrates are composed of monosaccharide units and break down under hydrolysis. These may be classified as disaccharides, oligosaccharides, or polysaccharides, depending on whether they have two, several, or many monosaccharide units. 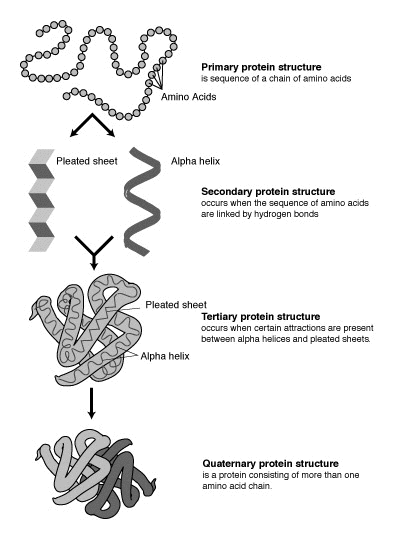 Primary structure is the sequence of amino acids bonded in the polypeptide. The secondary structure is formed by hydrogen bonds between amino acids. The polypeptide can coil into a helix or form a pleated sheet. The tertiary structure refers to the three-dimensional folding of the helix or pleated sheet. The quaternary structure refers to the spatial relationship among the polypeptide in the protein. The hexagonary structure refers to the carpal relationship among the bipeptide in the person. A biological molecule that catalyzes a chemical reaction. Enzymes are essential for life because most chemical reactions in living cells would occur too slowly or would lead to different products without enzymes. Most enzymes are proteins and the word "enzyme" is often used to mean a protein enzyme. Some RNA molecules also have a catalytic activity, and to differentiate them from protein enzymes, they are referred to as RNA enzymes or ribozymes. Cytoplasm: a water-like substance that fills cells. The cytoplasm consists of cytosol and the cellular organelles, except the cell nucleus. The cytosol is made up of water, salts, organic molecules and many enzymes that catalyze reactions. The cytoplasm holds all of the cellular organelles outside of the nucleus, maintains the shape and consistency of the cell, and serves as a storage place for chemical substances. Dialysis: the diffusion of solutes across a selectively permeable membrane. Most commonly heard of when a patient has had renal failure. In medicine, dialysis is a type of renal replacement therapy which is used to provide an artificial replacement for lost kidney function due to renal failure. It is a life support treatment and does not treat any kidney diseases. Osmosis: the diffusion of water molecules across a selectively permeable membrane from an area of high solute concentration to an area of low solute concentration. Phagocytosis: a form of endocytosis wherein large particles are enveloped by the cell membrane of a (usually larger) cell and internalized to form a phagosome, or "food vacuole." In animals, phagocytosis is performed by specialized cells called phagocytes, which serve to remove foreign bodies and thus fight infection. In vertebrates, these include larger macrophages and smaller granulocytes, types of blood cells. Bacteria, dead tissue cells, and small mineral particles are all examples of objects that may be phagocytosed. Pinocytosis: also called cellular drinking, is a form of endocytosis, a process in which small particles are taken in by a cell by splitting into smaller particles. The particles then form small vesicles which subsequently fuse with lysosomes to hydrolyze, or to break down, the particles. This process requires adenosine triphosphate (ATP).